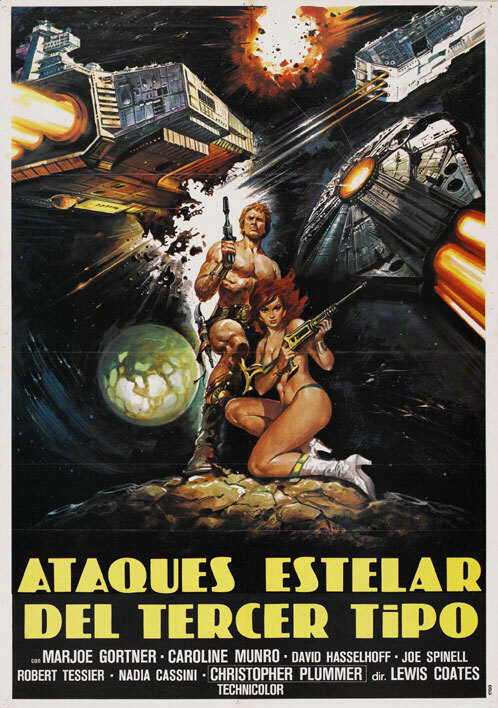 Luigi Cozzi's Star Crash (a/k/a The Adventures of Stella Star) is one of my favorite movies. 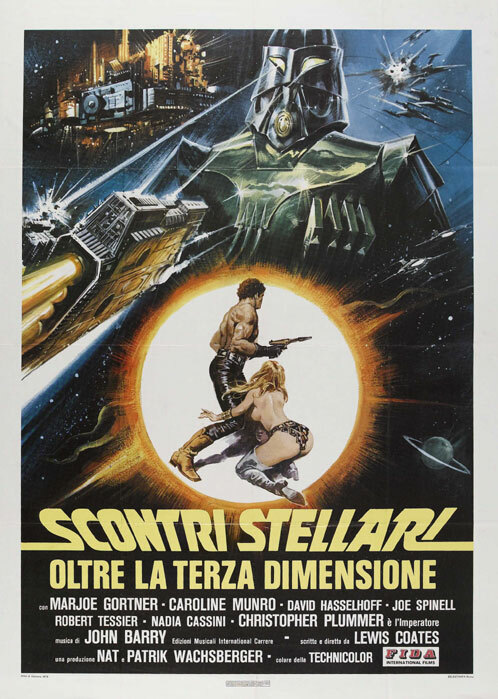 Usually dismissed as a cheap Italian Star Wars knock-off, it's actually much, much more than that: it's a cheap Italian knock-off of all three Flash Gordon serials, Barbarella, hundreds of pulp space operas and comic books, and a half-dozen Ray Harryhausen movies. It literally has everything: a scantily clad heroine, a comic relief robot, stop-motion monsters, lightsabre duels, space amazons, space troglodytes, a galactic villain with a beer belly, ray guns, awful spaceship miniatures, beach ball planets, Christmas tree light stars... and a score by Academy Award winning composer John Barry! It also has some delightfully pulpy movie posters. The one at the top is the American one-sheet, and it's kinda cool, but the other two – wow! I especially love the last one, where the artist had the balls to paint the Millennium Falcon (flying backwards!) as one of the spaceships. Actually, in all of these the spaceships look better than the ones in the movie. Nice post, Starcrash is one of my favorites too, hell Cozzi in general does it for me. That last poster did more than just rip-off the Millennium Falcon, it looks like it ripped-off the entire Star Wars universe. That's a unabashed Star Destroyer in the upper-left corner and if you look carefully in the lower-left corner, you'll see a whole squadron of small fighter-like craft swooping upwards, just like the X-wings in the Star Wars movie posters. Almost the same thing in the lower right corner. In fact, it looks like they just took the original poster for Star Wars and made of few adjustments. 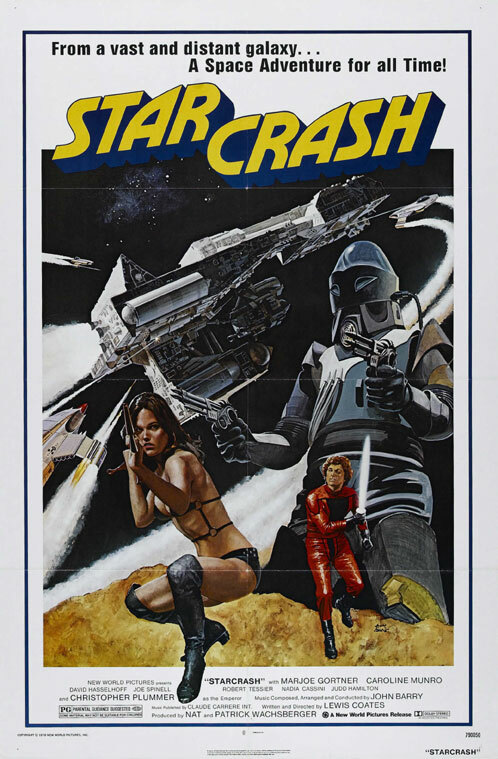 But I did like Starcrash too when I was a kid. Great stuff.